UPDATE: There are several BINDING resolutions recently introduced to follow the will of the people, as expressed in polls and the recent midterm elections, and end the occupation of Iraq by U.S. forces. You can read a rundown here. But, where's Ron Kind? Hmmmm? Isn't he concerned that Iraq is "bleeding our nation"? H.R. 353, introduced on January 9th by Rep. Ed Markey. House counterpart to Kennedy's Senate bill prohibiting funds for any more troops in Iraq. Fifteen co-sponsors. Where's KIND-O? HR 438 - To prohibit an escalation in the number of members of the United States Armed Forces deployed in Iraq. Introduced by Rep. Jesse Jackson, Jr. on 1/12. One co-sponsor. Where's KIND-O? HJR 14, introduced on January 12th by Rep. Walter Jones (R-NC). Concerning the use of military force by the United States against Iran. Eleven co-sponsors, including two more Republicans. Where's KIND-O? HR 455 - "Protect the Troops and Bring Them Home Act of 2007." One co-sponsor. Where's KIND-O? HR 508 - "The Bring Our Troops Home and Sovereignty of Iraq Restoration Act." Introduced 1/17 by Rep. Lynn Woolsey with two co-sponsors so far. Where's KIND-O? Contact Ron Kind and let him know you think he should start taking some action to go with his March 2003 and October 2003 and September 2004 and December 2006 tough talk. Read original post below the fold. I don't really like Patrick Buchanan. But he's right to call the Democrats in Congress who voted for the war before they want to vote against it contemptible. In particular, Buchanan points out that, while Bush has clearly signaled his intent to attack Iran next, Democrats are still tiptoeing around non-binding resolutions. And "King Democrat", Lieberman, who was defeated in his primary and had to run as a third party (which has now been taken over by critics) "independent Democrat", is the lone "bi-partisan" enabler of the Iraq occupation and, no doubt, the planned aggression against Iran. anti-war epiphany a couple of years ago, who is doing the most now to ensure that Iran is not on the list - as much as a human in the real world can do to affect a president living in a fantasy land. Jones' Joint Resolution, "Concerning the Use of Military Force by the United States Against Iran," (HJR 14) forbids the use of force against Iran unless Congress is consulted and approves first. UPDATE: Thank you to everyone who braved the bad driving conditions and cold weather to join us for this event. Thanks, too, to Pastor Mark Solyst and Pastor Kent Johnson; English Lutheran Church; Mrs. Roberta Stevens, NAACP president; Mrs. Barbara Martin-Stanley; Elizabeth Fox; Maureen Freedland; June Kjome and everyone who brought refreshments or WAFER donations, everyone who helped set up, serve and clean up, and everyone who sang all three verses of "Lift Every Voice and Sing!" "True compassion is more than flinging a coin to a beggar. It comes to see than an edifice which produces beggars needs restructuring." 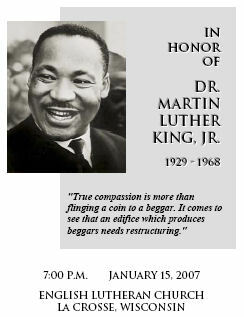 And, if you're interested in helping plan the 2008 King Day event, you can sign up or email me. 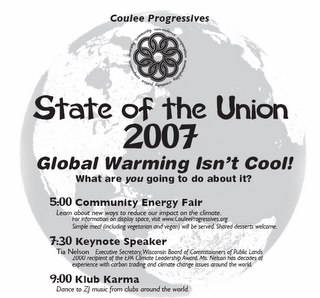 Coulee Region Progressives' Third Annual State of the Union event will be Friday, January 26 from 5 p.m. to 11:30 p.m. This years' theme: global warming and personal action. The evening will start with a Community Information Fair with information and ideas about living more sustainably and reducing your personal energy use - home construction, ideas for reducing energy consumption, transportation alternatives and more - plus displays and information from groups working locally and state-wide on climate change issues. Network, exchange ideas, get motivated! A simple dinner including vegetarian and vegan items will be served. This year's keynote speaker is Tia Nelson, daughter of Gaylord Nelson, the founder of Earth Day. Ms. Nelson has decades of experience in climate change issues, and now serves as Executive Secretary of Wisconsin’s Board of Commissioners of Public Lands. Following Nelson’s talk join us for Klub Karma and dance to ZJ music from clubs around the world. Admission is by a "sliding scale" donation of $3 to $15, along with a non-perishable food item for the WAFER pantry. Those who wish to may bring a potluck dessert or finger food item to share. If you'd like to reserve display space, please click below. We have a limited number of long tables. If you'd like table space, we request a donation of $5 per 1/2 table (3 to 4 feet) or $10 for a full table. We are especially interested in groups or individuals who can show how they have made a difference and can help others with things like sustainable living; making conscious transportation decisions; using solar energy/living off the grid; local food production and more. This will be a great opportunity to spread the word, exchange ideas, find new contacts. Please email Cathy at cvmaren@mwt.net or RoZ at z@purplearth.net to sign up. The sooner the better - once space is gone we can't add more! This just in from Peace Action. The Bush Administration want to start building new nuclear weapons! The Energy Department program is called Complex 2030, but in reality the name should be Nuclear Bombplex 2030. Click here to contact the Department of Energy and demand that they abandon their “Bombplex 2030” plan, which is a threat to the security of the U.S. and the planet. This plan was made public just a few weeks ago, and only when the Department of Energy (DOE) released a Notice of Intent to prepare a programmatic environmental impact statement for Complex 2030. They are holding hearing across the country right now – we’re notifying members who live near those hearings so you can attend – but it is also possible to send a comment via email to the DOE, and they are obligated by law to take public comments. DOE wants to build a new nuclear weapons complex and design and build a new bomb in it. Why? Well, lots of dollars for Bechtel and other contractors, of course. But also to make sure we lure a new generation of physicists into bomb building - - without a nice shiny plant and an exciting new bomb to work on, it's hard to get bright young men and women to build weapons of mass destruction. Listen to some of DOE/NNSA's own words: "In our vision for the nuclear weapons enterprise of the future Reliable Replacement Warhead concepts will be more easily and efficiently manufactured at fewer, modernized facilities with safer and more environmentally benign materials." That's not just bad science fiction writing, folks, it's from the Foreword of the DOE's Complex 2030 planning document. These people have no sense of irony: headline for the Foreward-Start with the end in mind. While DOE wants to make the new nuclear weapons complex sound lean and clean, they want to reassure us, too. "These replacement warheads will have the same military characteristics, be carried on the same types of delivery systems, and hold at risk the same targets as the warheads they replace, but they will be re-designed for long-term confidence in reliability and greater security, and ease of production and maintenance. " Building the new bomb-The Reliable Replacement Warhead-is Strategy 1 in Bombplex 2030. Strategy 2 is to build a modernized, cost-effective nuclear weapons complex. The new complex will maintain weapons labs at Lawrence Livermore and Los Alamos, build new facilities at Y12 in Oak Ridge, build a new plutonium center at a site to be chosen, modernize the Pantex assembly plant in Texas, make tritium at Savannah River, privatize much of the nonnuclear production of bombs (now done in Kansas City), and consolidate high explosive work at Pantex. You'll be glad to know that as part of Strategy 3, the NNSA plans to "Create a culture that manages risk rather than one that seeks to eliminate it." Sorry, you read that right. First things first: Tell someone else about this. We have to organize. Second: Go to a hearing, write comments and send them in. Get on the phone or go to a meeting with your Senators and Representative. Be loud and clear and honest and brave. Tell them we can not lead the world toward nuclear proliferation. Tell them we want true security, rooted in taking care of people in this country. Send your written comments by email to Complex2030@nnsa.doe.gov or to the address at right. Comment period ends January 17, 2007.
your gift now so we can continue to do this work. Give more than you usually do. This is important. Theodore A. Wyka Complex 2030 SEIS Document Manager Office of Transformation U.S. Department of Energy, NA-l0.l 1000 Independence Avenue, SW. Washington, DC 20585.